Paul Meyerson was Rita Barksdale's latest partner in "I Don't". A middle-aged middle-class man, he was disliked and ignored by most people for his overbearing attitude - Rita having a notoriously crap taste in men. When they were children, he and Jake Morgendorffer were in Boy Scouts together. In adulthood, his workplace had made him Vice President at 29. He was Rita's first partner after Roger, her dead skydiving boyfriend, and Amy Barksdale confused him for Roger. Paul had been unaware Roger existed. 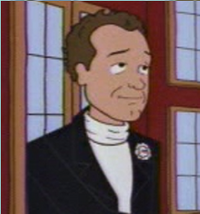 The MTV flipbook "It Takes Two to Tangle" claims she went out with the dull, pathetic Meyerson in reaction to the more adventurous Roger's death. During Erin's wedding reception (where he planned to leave and play golf later), he abandoned Rita to hang out at the bar with Jake, boasting about his career and boorishly saying "Rita's a little flighty, of course, but she's a tiger in the bedroom". Jake got extremely fed up but held his tongue (until he didn't). When Paul later got drawn into a spat with Jake and a drunk Helen, Erin immediately assumed Paul had started it and implied this had happened before: "Oh, you know perfectly well what's going on, Mother. Your pathetic boyfriend is making a scene!" Once the cops showed up to investigate the reception's fighting, Paul bribed them to go away. This page was last edited on 1 April 2018, at 13:27.